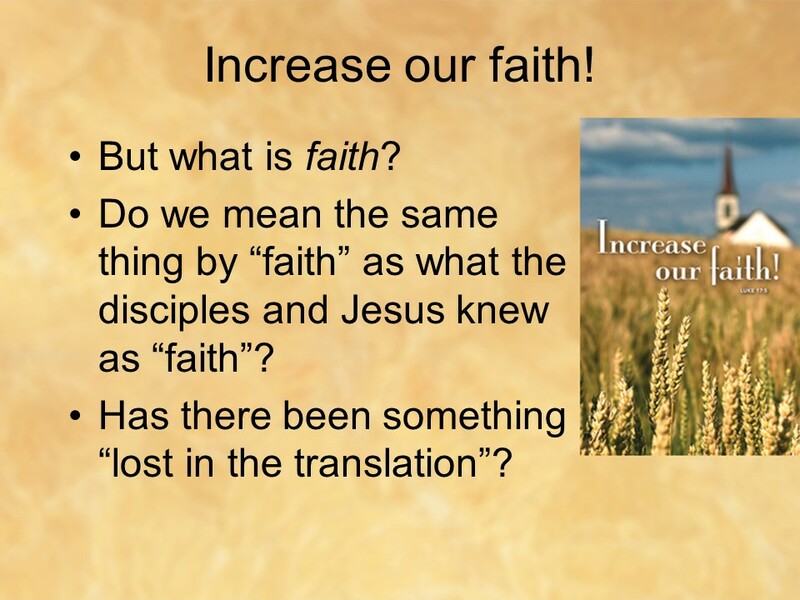 “Increase our faith!” cry Jesus’ disciples. 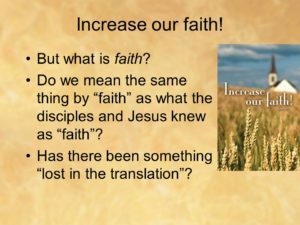 But we might ask, “What is faith?” Do we mean the same thing by “faith” as what the disciples and Jesus knew as “faith”? Has there been something “lost in the translation”? What’s at stake is also one of the most crucial points of change in today’s church. 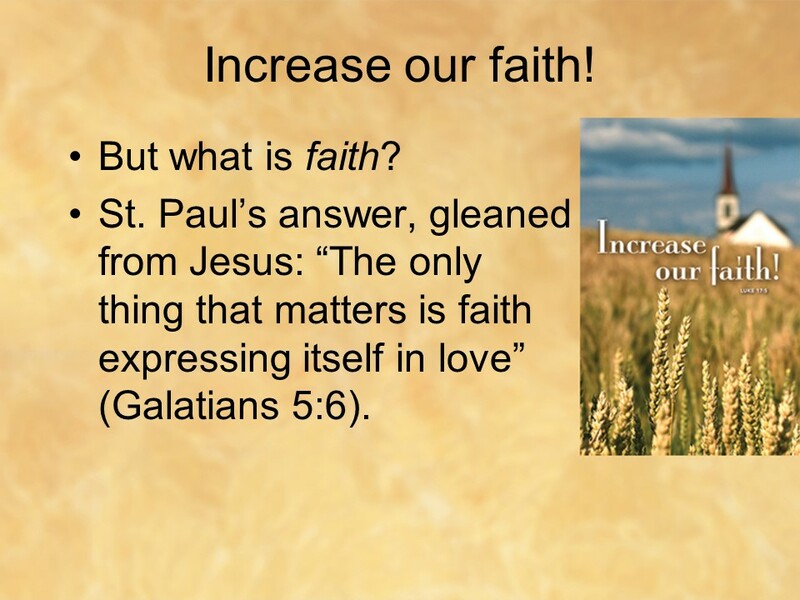 When we hear the word “faith,” what does it mean to us? For a number of generations, the word has tended to point to what a person believes. 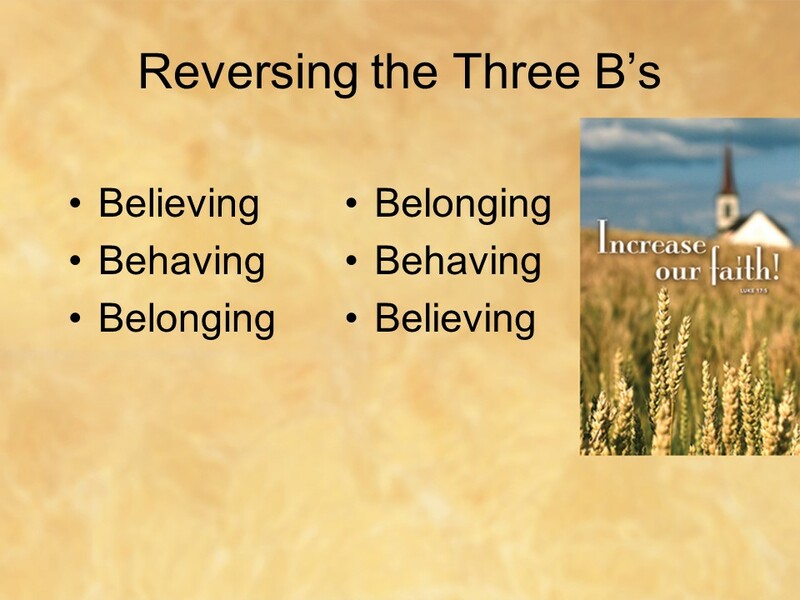 Beliefs are commonly defined as opinions or judgments about which a person or group is fully persuaded. Faith as “believe” is more of a “what” word: what one believes, usually producing a list (like a creed often does). 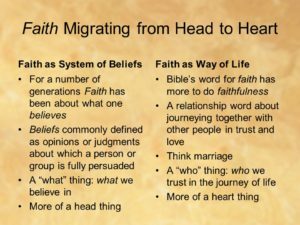 Faith as a system of beliefs is more of a head thing. But more recently, especially with guidance from biblical scholars, we are learning that the Bible’s word for faith has more to do faithfulness — in other words, it’s a relationship word about journeying together with other people in trust and love. Think marriage. Faith as a trust word makes it more of a “who” word: who we trust in. Faith as a way of life is more of a heart thing. How have you like our little ‘experiment’ with the Apostles’ Creed? We made a small change to reflect exactly what we’re talking about here today. We changed “I believe” to “I trust.” Such a small but subtle change converts the Creed as a “Confession of Faith” meaning a list of beliefs into a “Confession of Faith” in the sense of in whom we are placing our trust. There’s a short background article on the biblical words on the Deacon’s Table.2 We’ve had very positive feedback on this change. Thank you. 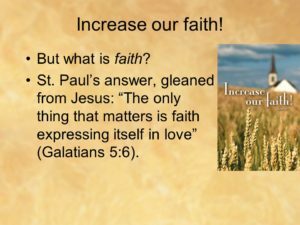 Jesus and Paul were not denying their tradition as a system of beliefs by emphasizing faith expressing itself in love; they were faithfully extending it, letting it grow and flow forward. In Jesus’s words, they weren’t “abolishing the law,” but rather they were “fulfilling it” — fulfilling its intent, fulfilling its potential (Matthew 5:17). They were decentering old things — religious rules, temples, sacrifice, hierarchies, and the like — and recentering the tradition on love. They called for a migration to love, and so must we. Recentering is one way to talk about it. Another way to see it is as a reversal of emphases. 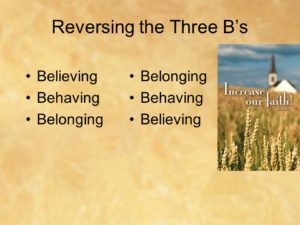 Extemporize on the three B’s (a central idea from Diana Butler Bass’s Christianity After Religion: The End of Church and the Birth of a New Spiritual Awakening). Overview: in the church of recent generations, we look for a new church on the basis of lining up what we believe and how we do things to determine if we belong. For Jesus it seemed to be the reverse: he called disciples to belong with him, teaching them what to do by following him, and what they believed famously trailed behind. 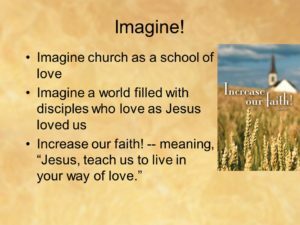 Imagine what would happen if for the next five hundred years, our churches were focused on being ‘schools’ for learning how to love.4 Imagine the Sunday School and confirmation curriculum. 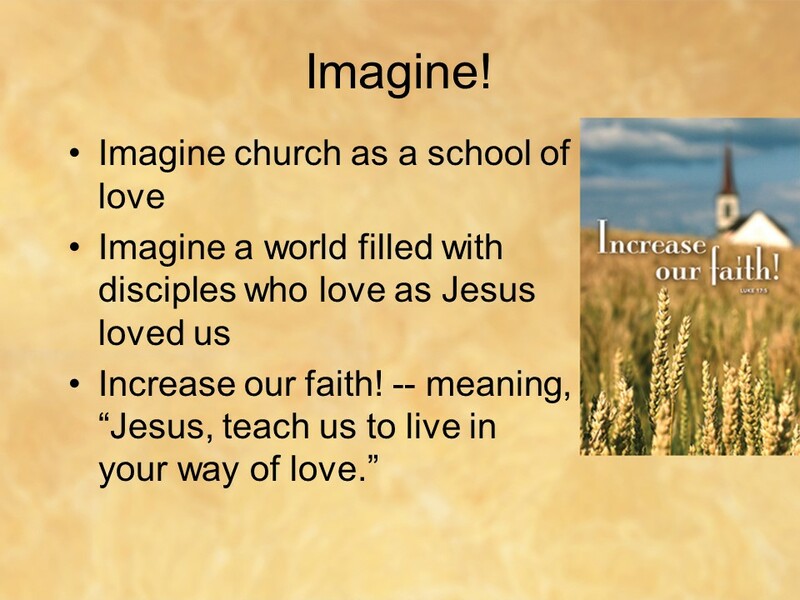 Imagine the adult education classes focused on learning how to love like Jesus loved us. Imagine, then, how different the world might be: how differently love-motivated teachers and engineers would teach and design; how differently love-directed lawyers and doctors would seek justice and promote well-being; how differently love-driven businesspeople would hire, fire, budget, and negotiate; and (the important one this month!) how differently love-guided voters would vote. Imagine! Thousands of church boards will meet this month asking a predictable set of questions: How do we pay the bills? What do we do about declining numbers? Why don’t young people attend anymore? How can we find good staff when we can’t afford decent salaries? But sooner than many people think, tens of thousands of church boards will meet to ask this question: What can we do to better teach our people to love? That’s not the kind of question you answer in one meeting, but it has the potential, if it’s the primary agenda item for six months, to help a congregation experience something more meaningful than survival and more powerful than revival — namely, a great spiritual migration toward love. 1. This sermon is based on the first of three spiritual migrations in Brian McLaren’s newly released book (Sept. 20) The Great Spiritual Migration: How the World’s Largest Religion Is Seeking a Better Way to Be Christian. I highly recommend this book for all! It is the essential guide to being better Christians for the sake of the world. This sermon draws on Part 1 of the book, the first of three great spiritual migrations that he elaborates. The plan is for my next two sermons to draw on each of the other two migrations in succession (link to Part 2). 2. 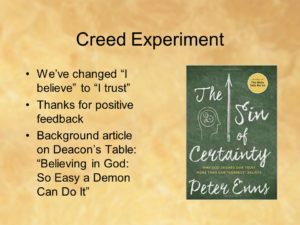 Peter Enns’ recent book The Sin of Certainty: Why God Desires Our Trust More Than Our “Correct” Beliefs is on-target for the theme of this sermon as a whole. The excerpt I printed for the congregation are several pages very helpful to understanding the biblical words for faith, the beginning of ch. 5, “Believing in God: So Easy Even a Demon Can Do It,” pages 92-97. 3. This move of using Paul’s language in Galatians 5:6 is from McLaren, The Great Spiritual Migration, pages 44-46. 4. The next two paragraphs draw heavily on McLaren, The Great Spiritual Migration, pages 65-66.